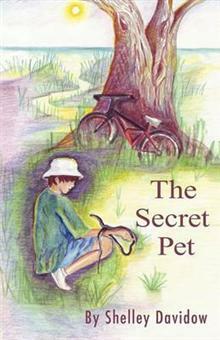 The Secret Pet follows the delightful Early Reader Series of books also written by Shelley Davidow. In this first chapter book, we meet again several of the characters from the introductory series, most notably the boy Tim and Jake the (magical) Snake. Tim and Jake become fast fr... read full description below. The Secret Pet follows the delightful Early Reader Series of books also written by Shelley Davidow. In this first chapter book, we meet again several of the characters from the introductory series, most notably the boy Tim and Jake the (magical) Snake. Tim and Jake become fast friends, both of them deciding that they simply must be together. This entails Tim sneaking Jake into his home (since Tim's mother is not very fond of snakes) and into school (where pet's really aren't welcome). Through their adventures, they both discover some truths about the differences between life in the wild and life in a home, and how it is that we change our habits and inclinations out of love for one another. A perfect chapter book for young readers who are learning to decode consonant and vowel blends, punctuation meaning and sentence structure.